A massive 1.12m viewers watch the FIFA WCQ: Aus v Iraq match on SBS last night, the biggest numbers on SBS all year, and pushing the broadcaster into fourth place. It was SBS’s best numbers since a 2010 World Cup match between Australia and Ghana. The game was the fifth most watched show on Free to Air last night, and in Sydney was the highest rated show all night on 434,000 viewers. The win was even enough to relegate the ABC into fifth place for the night. On FOX Sports, where the game was Live a huge 549,000 watched the game -the third biggest audience ever for Foxtel behind a NZ v France Rugby World Cup final in 2011. But in an extraordinary night of television, the game was not the only upset of the night. Seven’s House Rules has finally eclipsed The Block on Nine. The show has made an extraordinary comeback since its first week, due in no small part to its bumper figures in the west. Seven network won with a share of 28.0% then Nine 24.2%, TEN 18.8%, SBS 14.8% and ABC 14.1%. Seven News was 1.26m for Seven then House Rules (1.16m), Packed to the Rafters (1.08m), Today Tonight (1.03m), Home and Away (971,000), Deal or No Deal (569,000), Border Security International (471,000) and Travel Unravelled (270,000). Nine News (1.3m) topped the night on Nine then The Block (1.13m), A Current Affair (1.07m), Hot Seat (791,000), Big Bang (747,000), The Celebrity Apprentice: Challenge (542,000) and Two and a Half Men (213,000). NCIS (823,000) led for TEN. TEN News was 702,000, MasterChef was 679,000, The Project was 570,000, NCIS: LA was 566,000 and The Simpsons was 430,000. Following the Aus v Iraq match for SBS ONE also coded pre-match and post match segments (is that a first by SBS?). Following these it was Venice 24/7 (203,000), World News Australia late (202,000) and World News Australia (182,000). ABC News (881,000) was best for ABC then 7:30 (643,000), New Tricks (610,000), Croc College (388,000), At the Movies (333,000) and Time Team (302,000). Shaun the Sheep was best on multichannels at 345,000. @Secret Squirrel – You’re right about the earliest WC matches of the group stages being at 1pm (Brasilia time), or 2am AEST. But there’s only one match (the last quarter final) scheduled for that time on a day when the tour is on. I’ll wager that if there’s a chance of a clash the tour organisers will probably just start the race a little earlier that day, especially if France are involved in that game. The remainder of the WC matches are scheduled for 5 & 6am AEST. @HardcorePrawn – I know they’re in diff TZ’s but some of the TdF stages run into the early evening local time and SBS will prob broadcast until 2am AEST, which will overlap with the lead-in for the 1pm Brazil matches. More importantly, the TdF finale on the Champs-Élysées won’t finish until around 10pm CEST/4am AEST which will clash with matches that k.o. at both 1pm and 3pm in Brazil. So actually over 2m people watched the game – and that doesn’t include all the people watching in pubs and other outside venues. What a great result for Australian sports and Australian TV. I’m not a soccer fan but I did watch it with clenched teeth and like all Australian sports fans was ecstatic with the win. Well done to SBS and I am so pleased they will be telecasting it in 2014. Few ad breaks and no one promoting other network shows like the commercial networks often do. I like the block but I would like to actually learn something from it! Same goes for House rules, you don’t learn anything from these 2 shows which is pretty bad. For those trying to second guess the time zones. The FIFA Executive Committee convened on Thursday 27 September, at the Home of FIFA in Zurich, and approved the kick-off times for the 2014 FIFA World Cup Brazil. The Opening Match will take place on 12 June in Sao Paulo, with a kick-off time of 17.00. Group-stage games will be played at 13.00, 15.00, 16.00, 17.00, 18:00, 19.00 and 21:00 local time, with knockout stage matches at 13.00 and 17.00 local time. The semi-finals will be played at 17.00 local time and the Final, on 13 July 2014 at 16.00 local time. We’re roughly 13 hours in front. @Secret Squirrel – Not to worry, Brazil and France are in entirely different timezones, there’ll be no clash between the World Cup and the Tour. Unless the cyclists go… reee-aallllly… sloo-ooo-oooowwww…. David Knox, I believe SBS coded the first Socceroos qualifier in the three parts too. But it would’ve been something they’ve just started doing this year. Suggestion to Nine. You have success wth stripping your reality shows at 7pm weeknights. Celebrity apprentice has not been a huge hit in its present format and should only be brought back in the stripped format. With The Block having that idiotic Zoo thing i got everyone in house to try House Rules. I wonder if others did the same. Geez..I got all excited for what might be in store for world cup ratings for Sbs,envisaging maybe 2 mill? Til I looked at the time difference.If I’ve figured correctly,calculating 13 hr difference between Sao Paulo and aest,and possible local Brazil starts of 1,3,4,5,6,7and 9pm..games will start at 2,4,5,6,7,8 or 10am over here. Does that mean that after 9.30 the viewers were watching SBS primarily and Ten (NCIS: LA) second? Really is amazing figures for a sporting event that is available exclusively live elsewhere. I’m aware not everyone has Fox but those numbers are staggering!! Think it will be interesting to see what the A-League rates on Friday nights on SBS next season? I’ll have an early stab at under 200k. One hour delay on SBS was neither here nor there and can’t see how it affected SBS figures. More convenient than inconvenient. Just don’t channel-surf at half-time and have ABC24 reveal the final score! Given the thousands watching in clubs the actual viewers would be much higher. Some on FOX, some on SBS. The last week of the World Cup will clash with the start of Le Tour. SBS will have some juggling to do even with SBS2 as a backup. Perhaps they can get special dispensation from the govt to broadcast different content on SBS HD from SBS1, especially as a significant amount of that will be during the wee small hours? lol thanks for the advance dates! This was one of the worst football games I have ever watched. The pitch was a disgrace, the Iraqi’s mobbed the Aussies like meerkats facing off to a viper and the Aussie play was pretty lackluster. I didn’t miss a minute of it! Won nil, won nil won niiiiilll! We’re off to Brazil. Oh, congrats to SBS too. Just imagine the numbers if SBS had been able to show it live. So, David, what are the broadcast arrangments for the World Cup? (Obviously our interest will end after the group stage). SBS will broadcast the 2014 FIFA World Cup live and exclusive from Brazil from 13 June to 14 July 2014. Don’t say TV Tonight never gives you dates in advance! So in total, it’s around 2.1 million viewers. Man! It just gets even better! 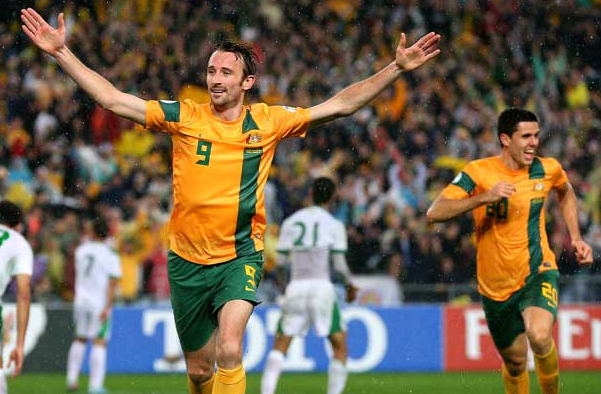 I am a huge Socceroos fan – I am so exited! Great photo David! Wooohooo!! Australia!